hobby to make our layouts smaller but with more operating value — a key focus of this site. 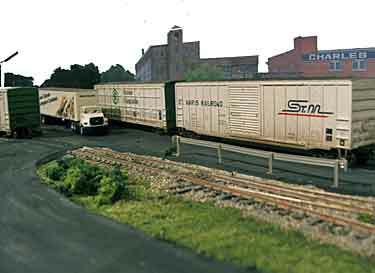 trend in model railroading and to illustrate the additional implied meaning of our new motto: it’s a smaller world! These photos show various scenes under development (we also saw some early photos in Scrapbooks #53a and #63a). Rolling stock and people models are still to come! The early overview (below) shows the track plan (photo is somewhat distorted due to manipulation to fit in this page). 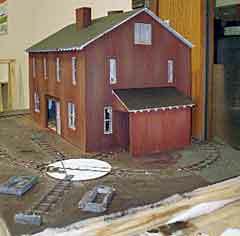 This project clearly illustrates the challenges and pleasures of modeling another country’s railroads! 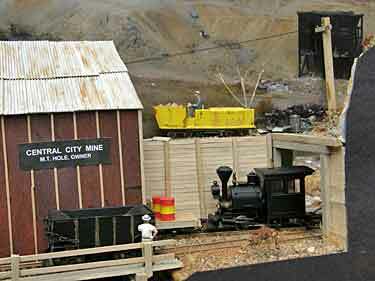 Duncan’s Mine is an HO mine-loader railway set in the Upper Peninsula of Michigan USA. Steve Grantham, from Bubwith, North Yorkshire UK, is building it from about 3800 miles away (6115 km). It has two baseboards with a total size of 52x8in (132x20cm). 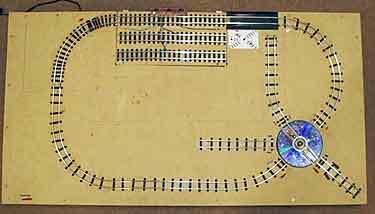 Steve reports, “There will be no points [track switches] on the layout, just a traverser. 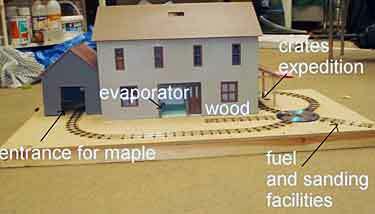 Motive power will be small switchers such as the Roundhouse EMD Model 40, and the cars ore jennies plus a few others to bring in supplies.” We’ll keep you posted on this one! MODELING JAPANESE ELECTRIC MAINLINES IN THE U.S.
Don Goodman-Wilson, from St. Louis, Missouri USA, has only visited Japan once, but he fell in love with the railways and has begun creating an N-scale layout to model “a typical electrified double-main, perhaps somewhere in the Tohoku region of Japan.” This prototype is 5100 miles (8300 km) away. Don’s planned layout will be built on a 1x4ft (30x120cm) shelf using Tomix FineTrack including two double-slip switches. Besides providing regular railway operations, Don’s design also works as an Inglenook shunting game — the left-hand main line on the left side of the board acts as the switching lead [head shunt] serving the interchange and team tracks. 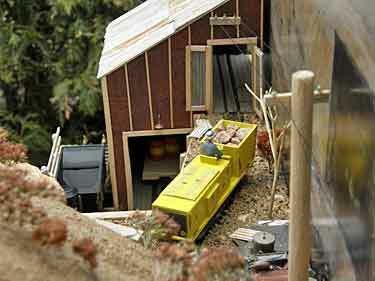 We’ll look forward to seeing pictures of Don’s Japanese railway model as it takes shape. 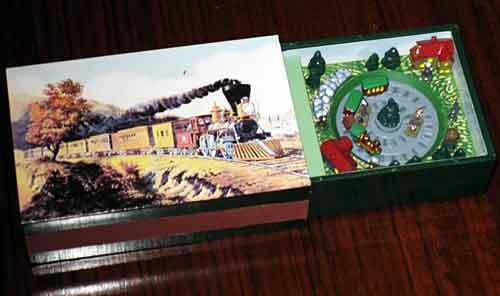 Jordi Vallès, who lives in Barcelona, Spain, received a railroading Christmas present from his grandson. Jordi reports, “It’s a music-box (made in China) with a very small train in movement when the music is started.” The little pizza layout is about the size of a package of cigarettes. Fabrice Fayolle, from Amiens, France, has placed the prototype for his new layout some 11,000 miles (17,700 km) away, on an island in the Tasman Sea, soemwhere southeast of Australia. Koonunga Junction is being built in 0e scale (On30/O16.5) measuring 1.35×0.45m (53x18in) and using hand-laid Code 83 track. 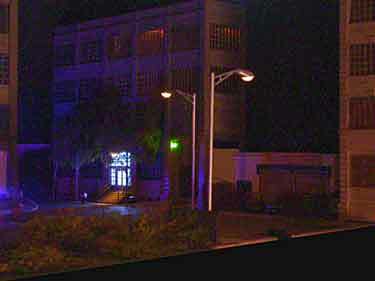 It’s an exhibition layout under construction in a “picture frame” stage (above) with built-in lighting. 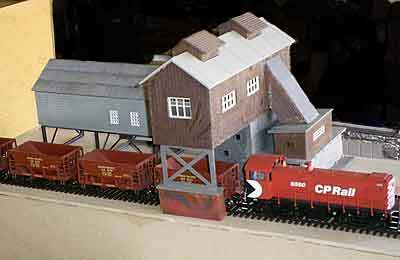 The unusual fiddle yard arrangement (below right) features two sector plates. The single-track plate completes the runaround which terminates the main line to Koonunga. The two-track plate represents track to a branch line, which also terminates here at the Junction. Rolling stock is an exotic combination of U.S. style locomotives and British and Australian wagons and coaches. 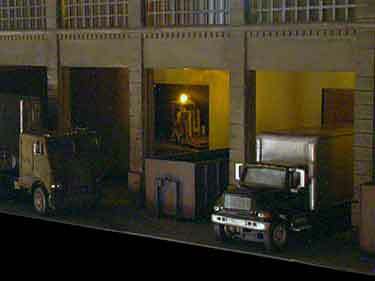 As Fabrice applies his well-known scenery-making skills (early examples shown here), we’ll try to bring you updated photos. Meantime, you can follow progress on his thread at Railroad Line Forums. 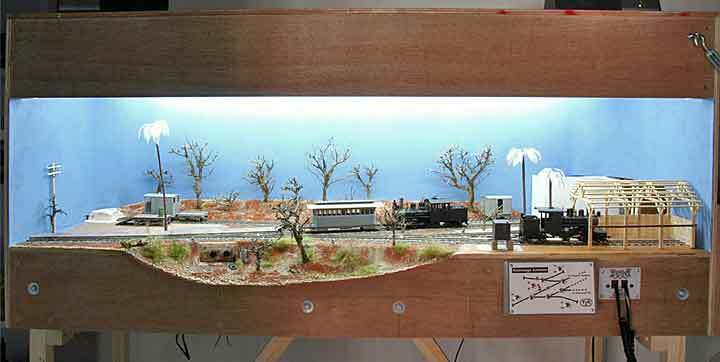 A EUROPEAN LAYOUT — AND PUZZLE — MADE IN THE U.S.
Peter Barnes and Joe Driscoll, both from the San Francisco Bay Area, USA, developed this layout and switching puzzles to provide a portable attraction for the European Train Enthusiasts (ETE) organization to use at train shows. 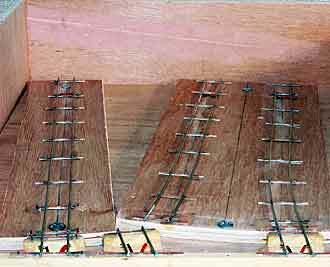 They started with a Timesaver and went on to develop a configuration that seemed to them to offer a more natural and railroadlike set of switching challenges (below). 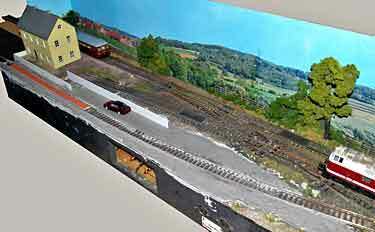 The layout is set in Germany, using HO Märklin trains and track, and it depicts a railway about 5800 miles (9300 km) east of their home in the western U.S.
A variety of switching challenges can be posed on this 80x20in (203x50cm) layout, at several skill levels. As a result it appeals to a wide range of people in the audience, from the very young to adventurous adults. The layout is built on a hollow-core door with carrying handles on all sides. It fits comfortbly for transport in the back of a station wagon with split rear seat. There are detailed construction information and a lengthy discussion of the operations at this website. It would be very easy for Terry Ashcroft to do prototype research in another country — he lives in Cobourg, Ontario Canada, just across Lake Ontario from New York State USA. 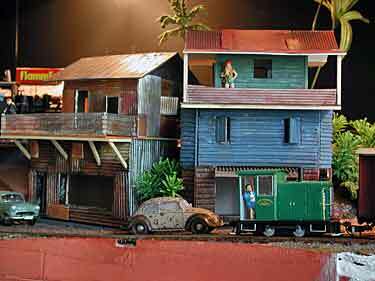 But instead, Terry traveled to and chose to site his model railroad in Colorado, about 1600 miles (2500 km) to the west. 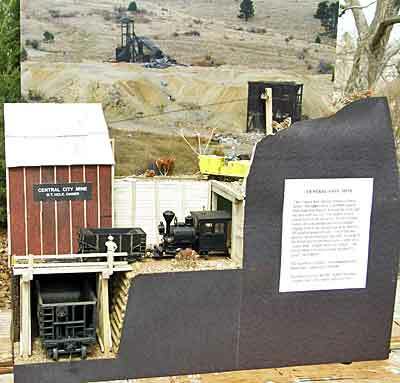 The tiny Central City Mine layout is built on three levels. 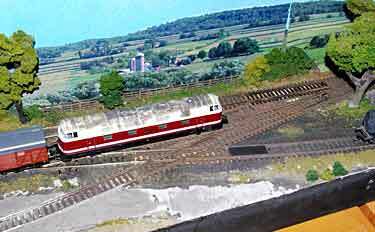 Chris Gilbert, from the West Midlands of England, chose to model an industrial switching district in Wisconsin USA, some 3760 miles (6050 km) from home. 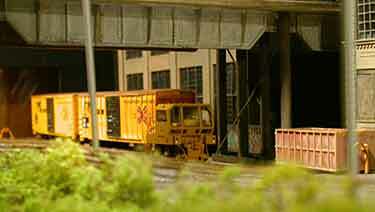 Old Goldern Black is a 72x12in (180x30cm) HO shunting layout in modern-US style. It appeared at a number of UK exhibitions and was featured, including a track plan, in Scrapbook #57a. The layout has now been retired and sold, so these hitherto unpublished photos represent a commemoration of a very successful venture into layout construction set in a distant land. Franck Combe, who lives in Paris, France, is modeling a maple shack located in the woods of Quebec, Canada — about 5270 kilometers (3274 mi) from home. 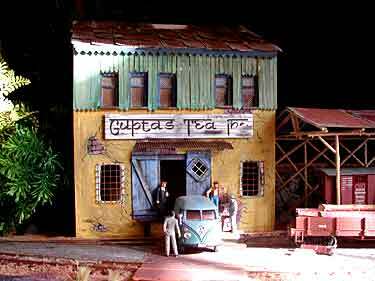 It’s a highly international project because the design is based on two of my layouts, Bott’s Cotton Gin Tram and The SAP Line. The Gn15 layout measures 97x52cm (38×20½in), and the turntable is constructed using an old CD, à la The SAP Line. Franck has added a very useful transfer table to the original Bott’s plan, hidden inside the farm building. 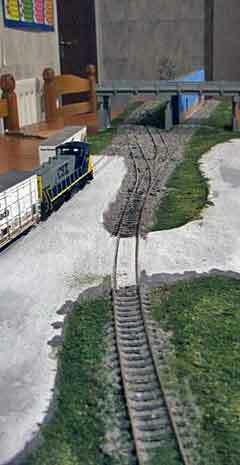 His captioned photo (upper right) indicates the operating use of each of the tracks in this busy little layout. 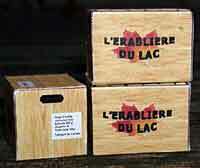 There are more photos on Franck’s blog. 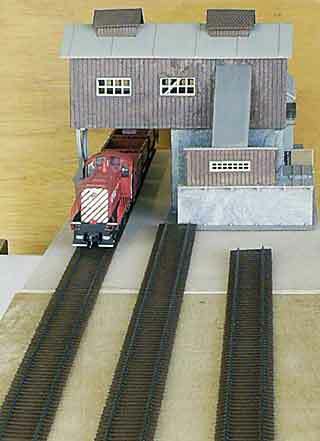 Last month in Scrapbook #73a we published the track plan and photos of Box Straße, a German branch line railroad under construction by Nick Palette, from Handsacre in Staffordshire, England. 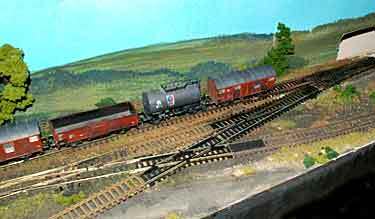 This project moves Jack Trollope’s classic Box Street Yard layout some 665 miles (1070 km) east. 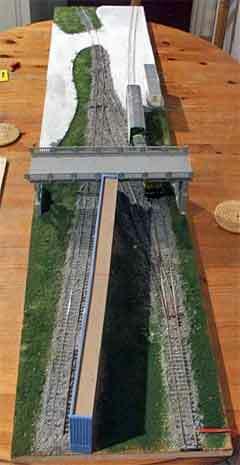 Here are some more work-in-progress photos of this interesting layout with excellent operating potential. It’s HO and measures 99x12in (251x30cm). A TREE MAY GROW IN BROOKLYN, BUT ITS MODEL IS IN SYDNEY! 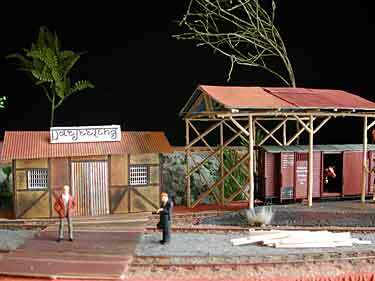 Prof Klyzlr, an Australian modeler who lives in Sydney, has traveled far afield for his latest layout project. He’s modeling the corner of 2nd Avenue and 41st Street in Brooklyn, New York USA… roughly 9928 miles (15977 km) away! 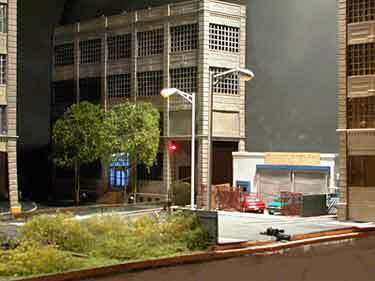 He’s using a combination of Internet research and collaboration with American modelers (including Larry Rickert, who actually lives in Brooklyn) to authenticate his scenic approach. Brooklyn: 3 AM has previously been featured in Scrapbooks #58, #63a and #71, and here are some new work-in-progress photos of this exciting long-term project. 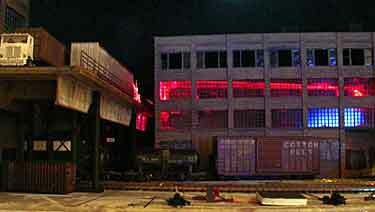 One unusual feature of this layout will be a rave party underway in an abandoned warehouse (below left). This photo is an early experiment in the lighting effects that, along with excellent ambient sound, will bring this party to life. 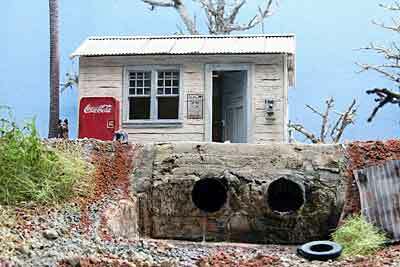 Stay tuned for more about this ambitious small layout! Remember to vote in our layout design contest! See full details on the Contest Viewing and Voting Page.